Helen Maurer's work explores the nature and exposure of illusion, whilst concurrently analysing the constituents of the image. Maurer's first solo exhibition features a new body of unclassifiable, visually arresting work comprising arrangements of objects placed on the surfaces of overhead projectors. Initially, these operate as sculptures, chaotic groupings of everyday detritus. However, these assemblies become intricate visual orchestrations, as they produce flat wall projections of resolutely ordered, near-photographic images. These works can be seen as chimera - equally as products of the imagination or memory, or as hybrids of once separate realms. Helen Maurer is a London-based artist who completed her MA at the RCA in 1997. Recent group exhibitions include: Not At Home, Gallery Westland Place, London (touring to Galerie Zrcher, Paris); Quotidian, Paper Bag Factory, London; and Casting Installing, National Glass Centre, Sunderland. The artist was recently commissioned by the Royal Holloway College in collaboration with Kinnear Landscape Architects. 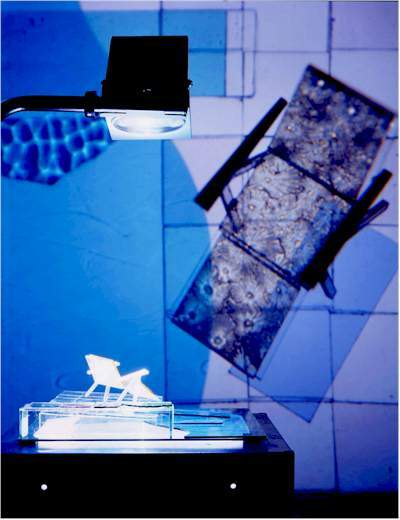 Maurer was Fellow in Glass at Central Saint Martins College of Art, London, 1994-95.